You must have a role with the “Administrator” or the “Manage Server” permission to be able to add Rythm to a Discord Server. If you have either of these permissions you should be able to change the name of your server. If you have the correct permission and still can’t see your server in the list, make sure you’re logged into the correct Discord account in your web browser. Note: If that still doesn't work, we suggest trying Incognito Mode in your web browser or a different browser to invite Rythm to your server. Rythm won't play my playlist! If when adding a playlist Rythm responds with "Failed to load, Something went wrong when looking up the track"
If this occurs, the playlist you were trying to play is likely a YouTube Mix, which is currently not supported on Rythm. For performance reasons, Rythm leaves after a while of being alone or unused in a voice channel. This helps Rythm save resources while no one is listening to it and keeps the music quality consistent for all users at any given time! Don't worry though, as long as you are in a voice channel, just type !summon to make Rythm rejoin your channel! For performance reasons, Rythm will clear/reset the queue when it leaves the voice channel. To get around this we suggest creating a YouTube playlist of the songs you wish to re-queue. Rythm uses something called rich embeds for its messages, which is an option that might be disabled on your client. Make sure it's enabled! 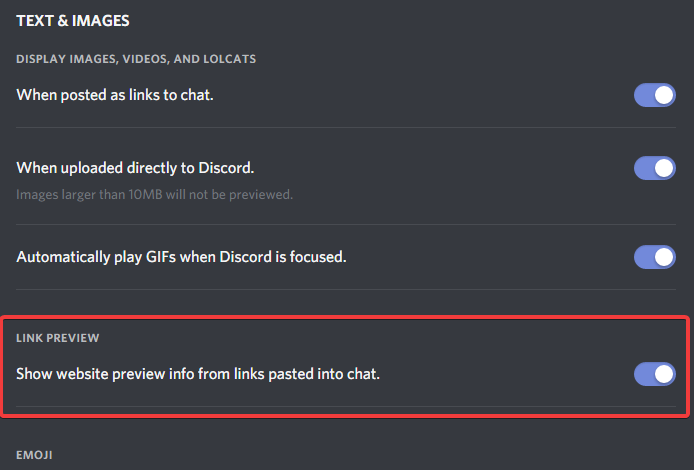 Go to your Discord User Settings > click on "Text & Images" > Enable "Show website preview info from links pasted into chat”. 1. Ensure you’re using the correct prefix. 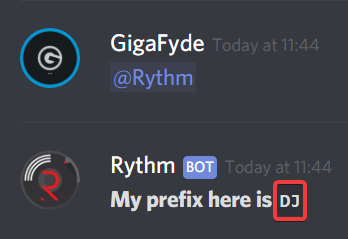 You can see the current prefix for Rythm by mentioning the bot. 2. Ensure Rythm has permission to send messages in the text channel. You can give the “Administrator” permission to Rythm to make this easier. 3. Check the #outages channel on the Rythm Bot Discord server to see if there are any known issues. 4. If the above methods do not work, please choose option 7 in our #help-desk channel on the Rythm Bot Discord server to receive assistance from a member of our Support Team. When you mention Rythm, do it in a text channel Rythm can send messages in. 2. Copy the Prefix response. You must Copy the part that is marked in red. 3. Run the prefix command. Paste the copied text in the chat box and right next to it with no spaces type: settings prefix ! Note: You must have a role with the “Administrator” or the “Manage Server” permission to be able to change Rythm’s prefix. 1. Move to a different voice channel. 2. !summon the bot into that voice channel. 3. Move back to the original voice channel. 4. !summon the bot back into the original voice channel. Try changing the server region of your server or kicking & reinviting Rythm to your Discord server. 1. Kick Rythm out of the voice channel and resummon it using the commands !dc and then !summon. 2. Go to your server's Server Settings and change the server region a few times until you find a region where Rythm does not lag. 3. Check the Rythm Bot Discord server by typing !invite and selecting the Official Discord option and then checking the #outages channel to see if Rythm is currently having any known issues. 4. Kick and reinvite Rythm to your Discord server. N.B: For donators: use the !vol command to check that the server's volume has not been set to 0. 3. Disconnect from the voice channel and Reconnect. 4. Check the Rythm Bot Discord server by typing !invite and selecting the Official Discord option and then checking the #outages channel to see if Rythm is currently having any known issues. 5. Check your output options in your Discord User Settings. 6. Check your computer's system volume. 7. Try reconnecting Rythm to your voice channel using the !dc and !summon commands. 8. Try changing the server region of your server a few times until you find a region where Rythm plays music. 9. Ensure that the music is not paused. You can check this by using !pause. If the bot replies with The player is already paused, use !resume to start the music again. 10. Invite Rythm into a voice channel, and while still in the channel, delete the channel. After, create a new voice channel and attempt to play music from the new channel. 11. Try to summon Rythm from a different text channel. If you are on mobile and you find that you cannot add Rythm due to the fact that the link to add Rythm produces a gray screen, then please try first heading to https://discordapp.com/login, logging in and then using the invite link again. If that does not work, we recommend using a desktop device. In short: You may want to try refreshing the website to add Rythm or use a desktop device. If you find that your issues with Rythm have been fixed but you still have questions. If you find that your question was not answered by the FAQ or this Troubleshooting page, please click here to join the official Rythm Bot Discord server.